There’s no denying that the programmer’s stock is rising. With a few finely tuned lines of code, computer engineers can make or break a company. After the CEO, or perhaps the chairman, the CTO is arguably the most important person in the business. But the perception that IT whizzkids sit quietly in the corner tinkering with Matrix-inspired formulas is an outmoded one, says Renaud Visage, co-founder and CTO of Eventbrite, the online ticketing company. Despite his claims that CTOs are all markedly different from one another, it’s fair to say that Visage is cut from a slightly different cloth to the stereotypical fusty old IT director decaying at a FTSE company. Also a professional photographer and explorer – Visage has more than a mild case of wanderlust – there’s more to this tech expert than meets the eye. “I’m not a nerd,” he smiles. Visage was born in 1971 in Vittel, (yes, where the water comes from) but only spent three weeks there. This was indicative of the nomadic lifestyle to come. “I probably lived in ten different places over my first 18 years,” he explains. They were always little towns and Visage didn’t get his first taste of the bright lights until he went to the École Centrale de Lyon to study engineering. “I’m not a small-town guy, so Lyon was a better fit for me,” he says. But Visage wasn’t into technology and science for its own sake. “I liked applied science, which is why I went into engineering,” he explains. After some thought, he decided to study civil engineering as he thought this would give him the sufficient opportunity to indulge another of his passions: photography. In August 2000, Visage left Geometrix to join web company Zing as a junior developer. “It was a demotion but I got paid 50% more. There was a big difference between industries, but the bubble helped,” Visage explains. “It was a brand new world. We were creating things and millions of people were using the site. We had a real impact. It was in the early days of digital photography, so it made us feel like we were pioneers,” he says. In Paris, Visage worked remotely for Sony, whilst doing some travelling and indulging his passion for photography. His photographs were, and continue to be, sold to the likes of Getty and other stock photo agencies. Then, in 2006, an interesting opportunity dropped into his inbox. A former co-worker at Zing had recommended Visage to Kevin Hartz, the founder of Xoom, an international money transfer service. Hartz and his now-wife, Julia, wanted to found an online company to help event organisers, which has subsequently become known as Eventbrite. One of the biggest challenges in the formative days was design – not that it’s possible to tell now. “None of us are designers – and it showed,” laughs Visage. The entrepreneur had no qualms about going into partnership with a couple. “Maybe I was naive, but I just thought, ‘they get along, they’re both smart, so let’s do something together’. I’ve never regretted it because all three of us work very well. We have different strengths and I think I saw that as a potential for harmony. Everybody has their own turf. They never had to worry about the tech part. I never had to worry about financing the company – Kevin had done it all before with Xoom. And Julia had done marketing as well as customer support for a while. “We all manage to fit in our roles. That’s important. When things don’t go well with co-founders, it’s usually because they encroach on each other’s turf. So we have that clear working relationship,” Visage explains. It’s certainly a formula that seems to be working. Eventbrite has attracted $140m of venture capital so far, and has processed more than 150 million tickets in over 198 countries since its inception in 2006. This equates to more than $2bn worth of tickets. The company’s expansion continues apace: it now has 329 employees, including a team in South America, where it recently acquired Argentina-based ticketing company Eventioz. 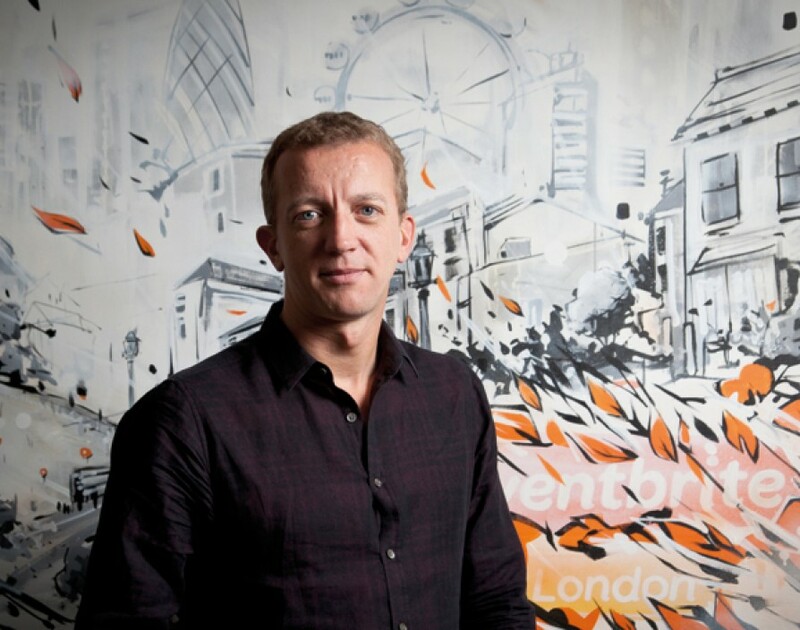 It goes without saying that technology is at the heart of Eventbrite’s offering. “We have an engineering team that can innovate,” says Visage. Indeed, the tech teams account for nearly a third of the company’s workforce. The main hubs are in London and San Francisco – two tech destinations that are often pitted against one another for the title of start-up capital of the world. Visage says it’s a pointless comparison.